I had been seeing previews for this movie here and there for awhile, so when it dropped on Netflix I decided to give it a whirl and was pleasantly surprised and somewhat sobered at the result. Based on The Operators, by Michael Hastings, War Machine is the story of General Glen McMahon (who is based on General Stanley McChrystal) who is brought in to bring a resolution to the conflict in Afghanistan, With him, comes a motley crew of aide-de-camps and deputies ranging from a civil media adviser (Topher Grace), to the Director of Intelligence, loosely based on Mike Flynn (Anthony Michael Hall) and a few others. They arrive in Afghanistan and immediately realize that they're stuck in a stalemate. The General soon casts his eyes on Helmand Province as a target for a surge of counterinsurgency operations designed to drive out the the Taliban and stabilize the country once and for all. Immediately, he runs into resistance- Washington doesn't like the idea. The Afghani Government is unhelpful (with President Hamid Karzai rather randomly, but excellently played by Ben Kingsley) but that does not deter McMahon one bit. He wrangles some face time with the President, lets slip to a reporter that he's spoken to the President maybe once since he's been in Afghanistan and suddenly his plan for more troops is approved. Enter the Rolling Stone reporter. Accompanying Team McMahon on their trip to Europe to drum up more soldiers from their reluctant coalition partners, Mr. Rolling Stone acts as the narrator of the entire movie. Team McMahon wrangles the troops, has a good time on the way- despite Tilda Swinton popping up as a German politician asking bluntly what on Earth they trying to do in Afghanistan in the first place- and heads back to Afghanistan to initiate his grand plan. 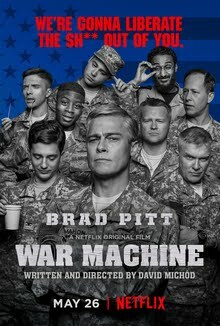 Amusing, darkly comic and sobering all at the same time, War Machine asks some serious questions about why we're in Afghanistan, what we've been doing there and what, if anything we hope to accomplish there. It's pretty clear that the movie thinks it's somewhat of a hopeless case and that's where it really sobers you up. We're still there, spending time, energy and money and lives doing what, exactly? What's the best outcome? How can we extricate ourselves from a country that's chewed up and spat out empires with ease over the centuries? I don't know, but I sure hope someone can figure it out.